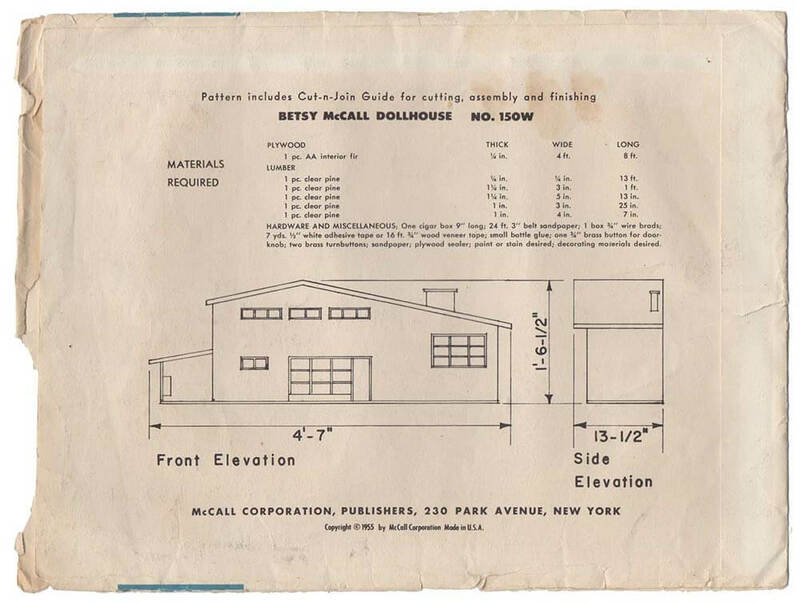 The reward for the 70+ tedious hours to build my 1955 Betsy McCall dollhouse? 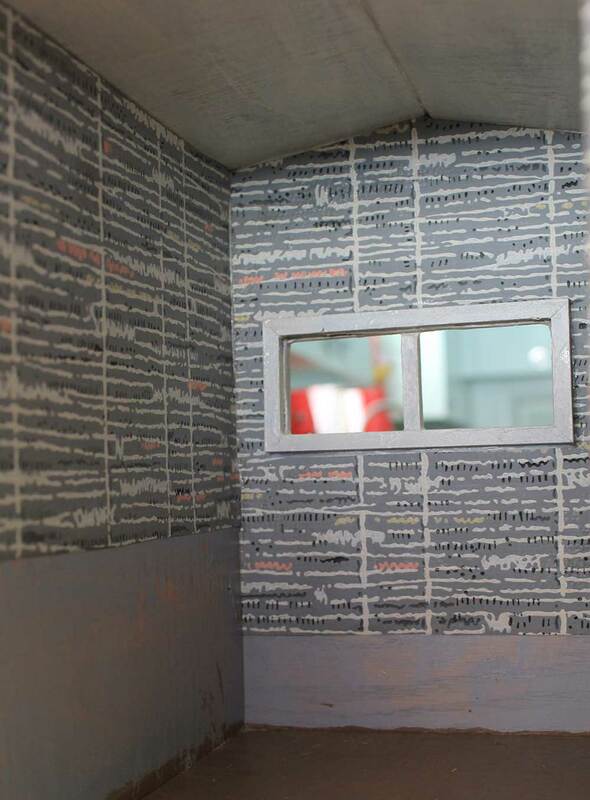 Now it’s time for the fun part — decorating the interior — starting with the walls. At first, I simply planned to use leftover paint, but Pam sent me a care package and as soon as it arrived — I was hook line and sinkered on wallpaper! Kitchen table? 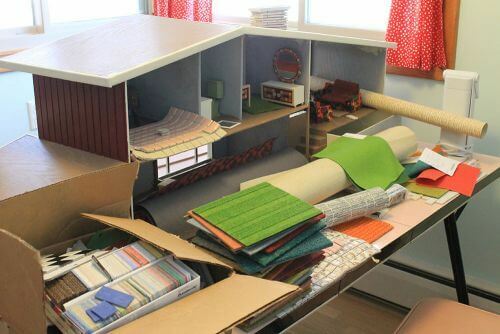 What kitchen table? 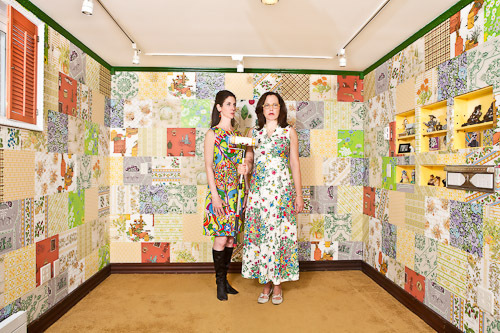 Pam used 18 patterns from her vintage stash to cover the walls in her big fat crazy crafty epic retro office remodel o’ 2012. 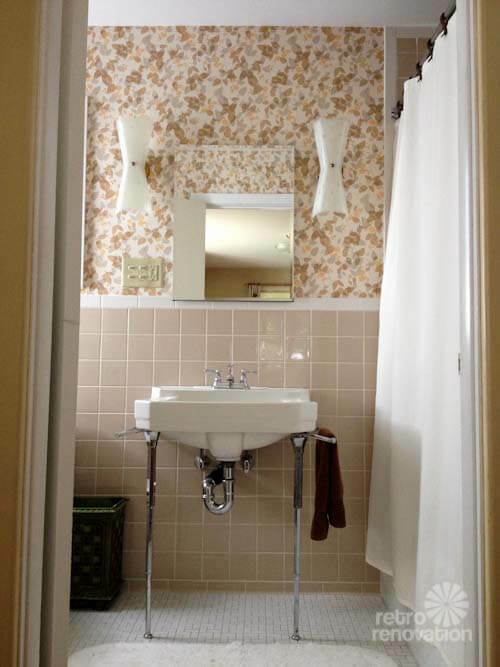 She’s also used her vintage wallpaper in her bathroom (twice), kitchen and foyer. I don’t use much — if any — pattern in my decor, so at first I wasn’t sure my dollhouse needed wallpaper, but then I opened the box from Pam and got excited. Pam is the world’s #1 fan of wallpaper. She has quite a hoard of vintage wallpaper in her basement, which she has collected a roll at a time from estate sales and from a nearby store that used to deal in wallpaper from the 1950s until about 2000 and still had a lot in its basement. For my dollhouse project, she went through the stash and looked for papers with very small patterns. Vintage wallpaper is just so pretty, and I do love it in small doses, and this is a small house, so why not take a nibble at that apple? Oh oh. 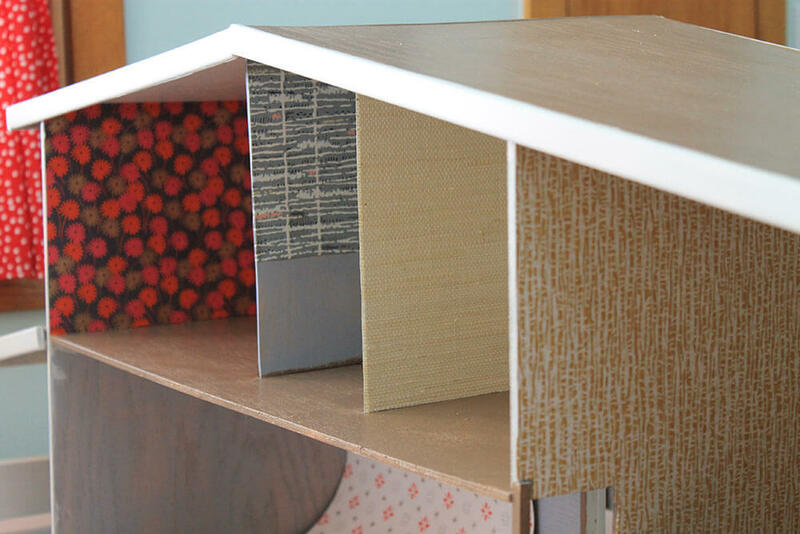 Ya can’t eat just one, and before I knew it, there was a wallpaper explosion — among other its and bits I had gathered for the project — and I was planning to install it in every room of the house. Pam and I discussed my somewhat surprising wallpaper-it-all decision and decided that this dollhouse is akin to an assemblage/collage type project, where adding extra layers — like patterned wallpaper — only makes the end result more interesting. 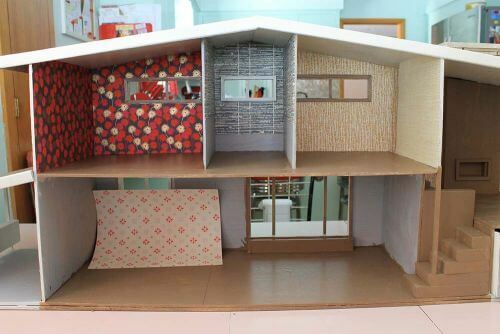 I agree, and personally, the patterns are so much easier for me to take on a small scale — in fact, I am loving all of the wallpaper in the dollhouse. 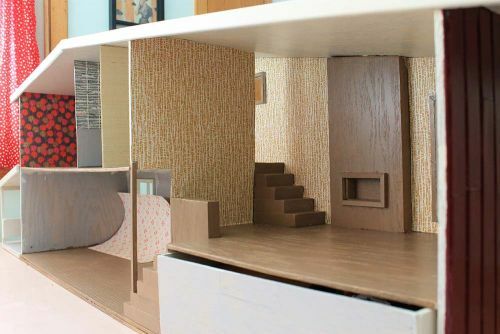 I think it does so much to liven up the small spaces and — once furniture and decor are added — will really add to the “wow” factor. Since I only had limited amounts of patterned papers, I was very careful to ensure that no mistakes were made while “hanging” the wallpaper. I made patterns out of plain white paper taped together and made sure to mark each to show which way was up and which side was the front. 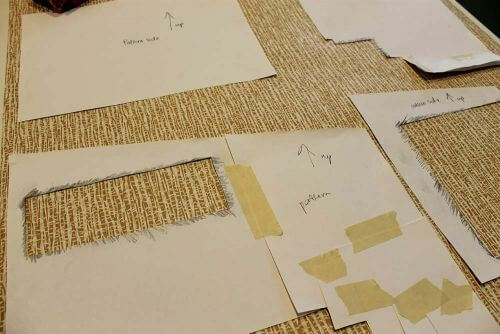 Then I laid out the paper patterns on the wallpaper, traced them and carefully cut them out. After a quick, last minute test fit, I used ModPodge to adhere the paper to the walls. 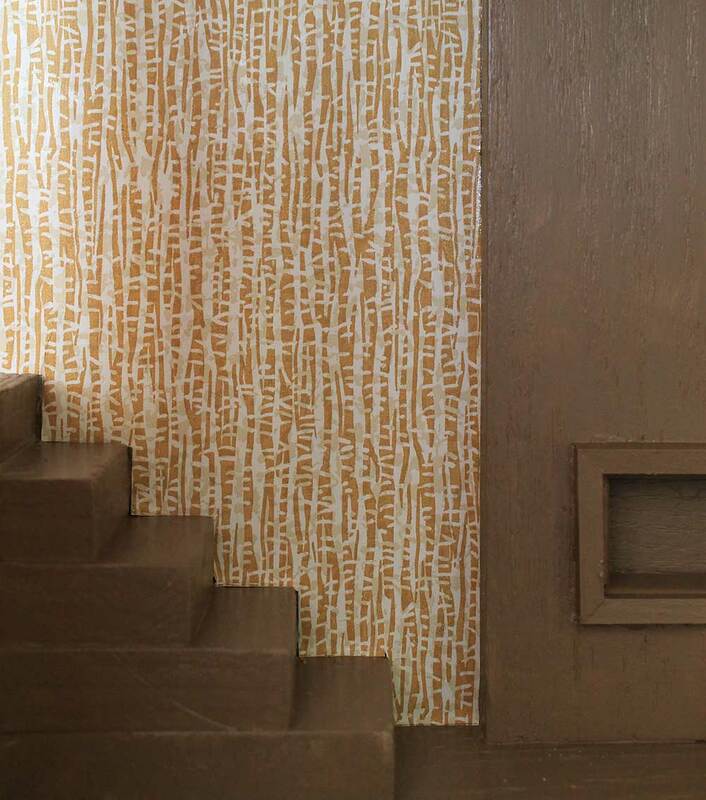 The main living room got this lovely gold, beige and white vintage small scale wallpaper pattern — my favorite of the bunch that Pam sent. 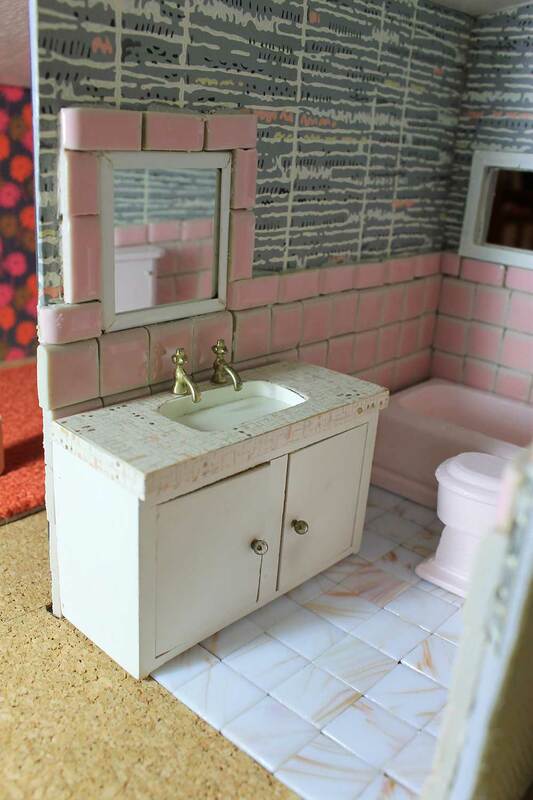 The wallpaper used in the living room of the dollhouse was a coordinate to go with the wallpaper Pam used in her master bathroom update. 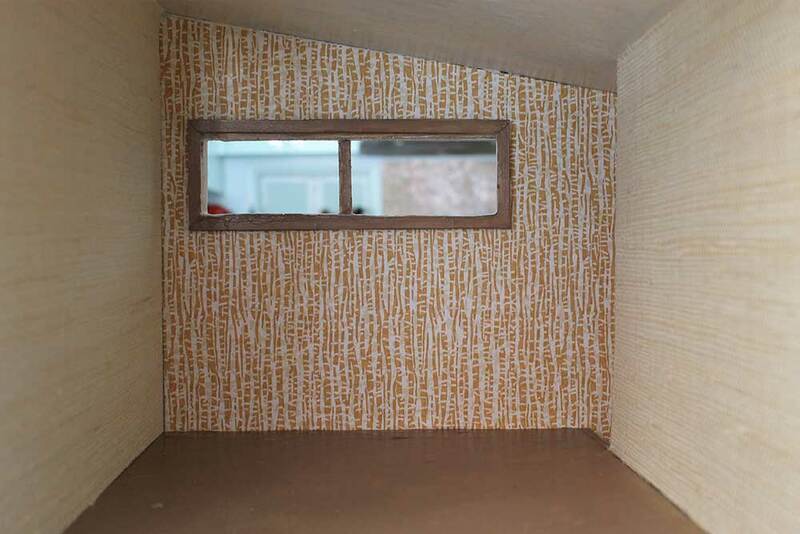 My dollhouse’s living room room wallpaper is actually a pattern designed to coordinate with the leafy vintage wallpaper Pam used in her master bathroom in 2013 (above). Pam purchased the rolls at an estate sale. Since the smaller bedroom had a shared wall with the living room, I continued the paper all the way into the bedroom for a seamless look. Next, to mix it up a bit, I used some grasscloth wallpaper — the same stuff Pam has in her living room and dining room — for the bedroom’s other two walls. 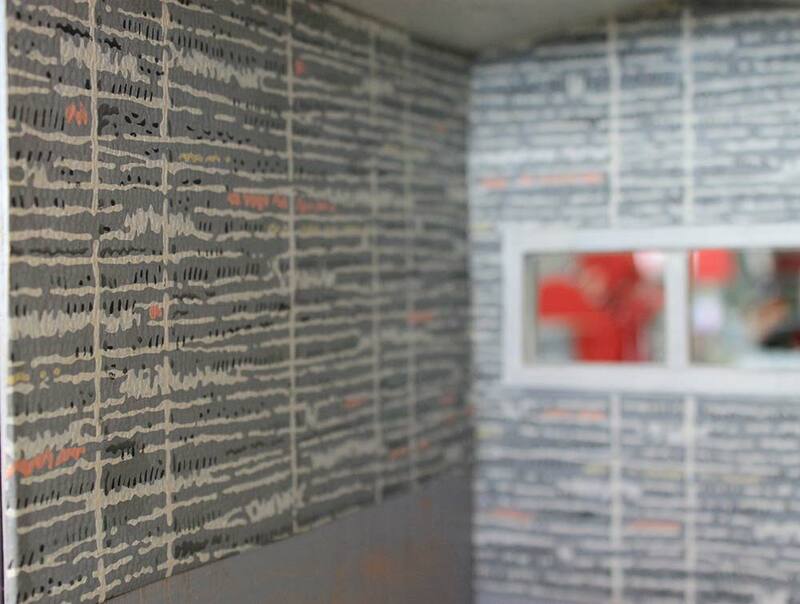 Hey, look — the bedroom has a wallpaper accent wall! 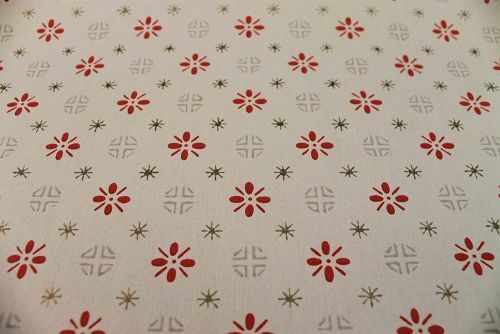 For the bathroom, I chose another small scale, linear patterned paper from Pam’s box. You’ll notice that I didn’t wallpaper all the way down to the floor — that’s because there will be tile covering up the bottom of the walls soon. I chose to paint the trim in the bathroom white to coordinate with the paper and other elements that will eventually be added to the space. I just love this pattern, don’t you? The only room that didn’t get vintage wallpaper in was the master bedroom. 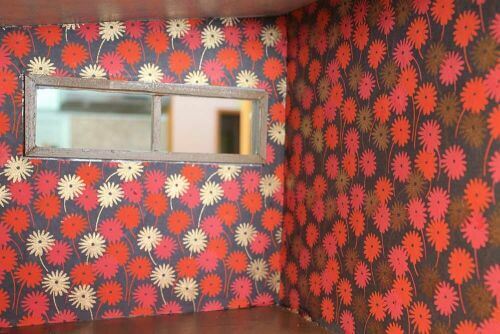 I really wanted at least one of the rooms in the house to have a bright, flower power feel. This paper is a decorative paper I bought a few years ago at a card and paper shop because I just loved the bold, saturated oranges and pinks and the fun pattern. And yes, those are metallic gold flowers mixed in! 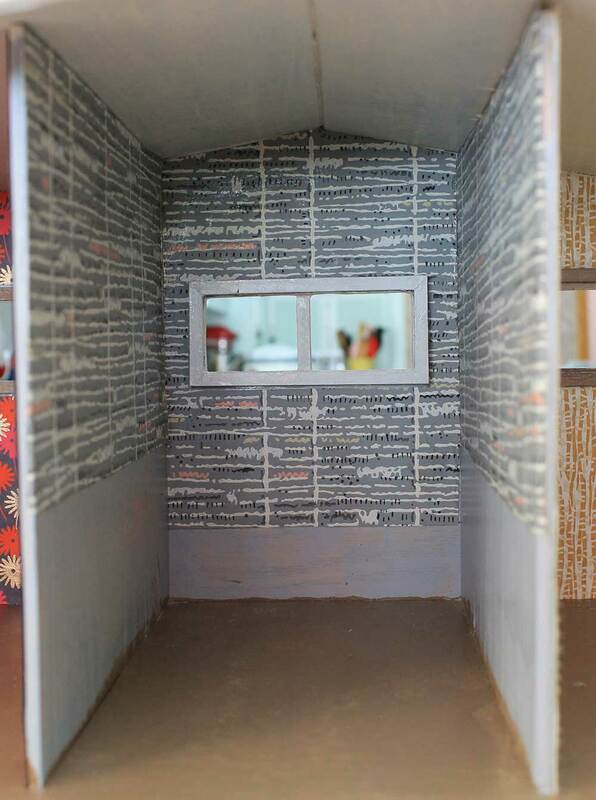 While I was gearing up for the dollhouse project, I ran across the paper and decided it would be perfect for the dollhouse. 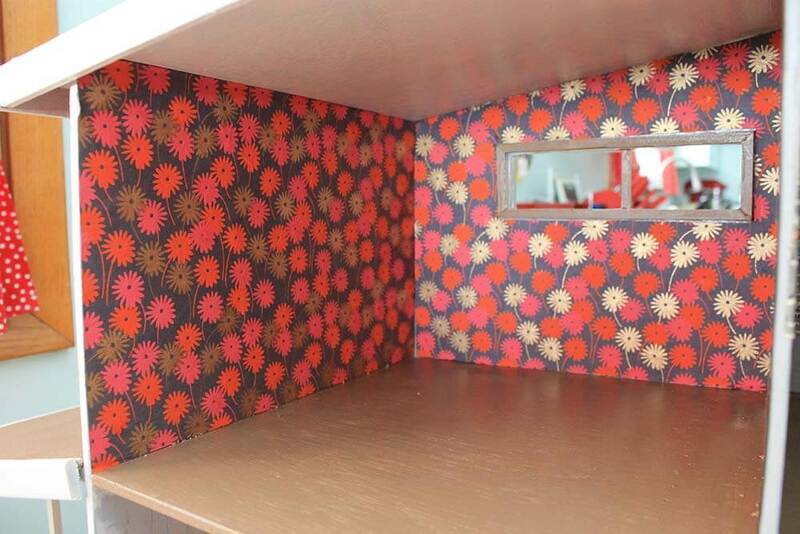 I love it and I think the scale is perfect to mimic late 60s to early 70s large scale, graphic metallic wallpaper patterns. 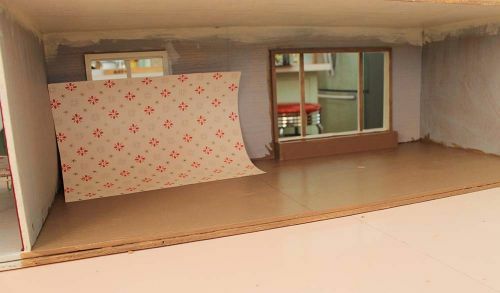 With four of the five rooms wallpapered, all that remained is the large, open kitchen and dining room area of the house. I already knew I wanted the kitchen color scheme to be white, red, and yellow, but the only paper I had with a color scheme that would work in the space is a small sheet — (not from Pam’s stash, she sent me larger pieces) — that will certainly not cover the room’s large walls. I was going to try and work with this remnant… but Pam encouraged me to reach out to one of our longtime advertisers, Hannah’s Treasures, and see if they had any small-scale, red or yellow prints that might work. Heck yeah! They are looking through their shelves right now to see what they can find for me to consider. Hurray — another box o’ vintage wallpaper samples will land on my doorstep soon. What Treasures will be inside!? 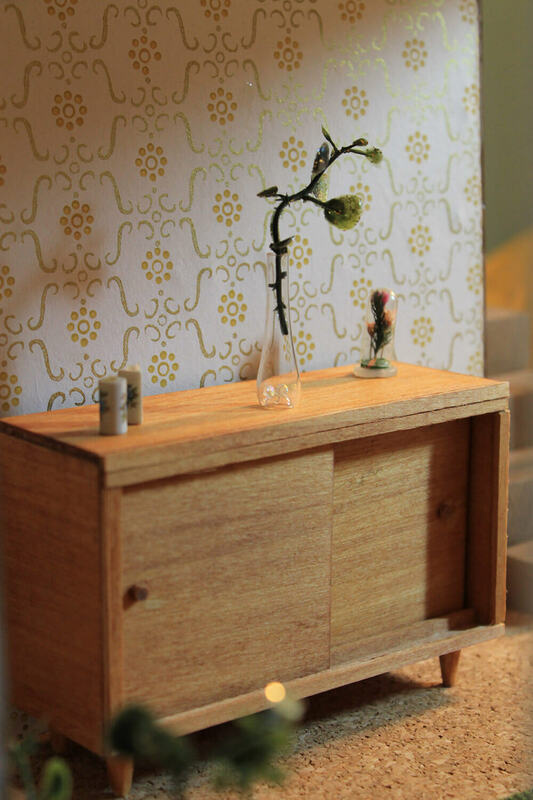 It is amazing how much the wallpaper brightened up the interior of the dollhouse already? Next up: I am going to start with some tiling and flooring while I greedily wait for the vintage wallpaper googies to come. Which if these vintage wallpapers is singing siren song to you, dear readers? 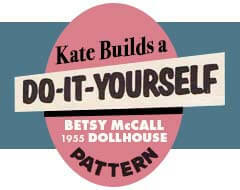 You can following all the stories about building and decorating my 1955 Betsy McCall dollhouse by clicking here. 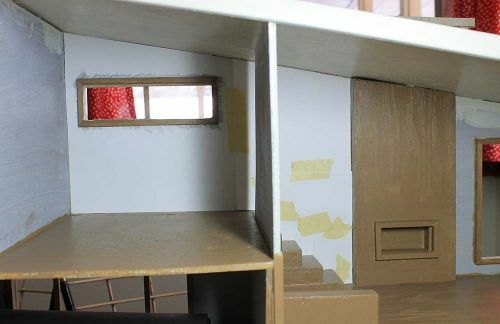 Too bad the little house can’t be disassembled and the walls papered or painted and then put back together – or can they and I missed that discussion? I boycott any website that forces you to watch a slide show as a new page view each time. This is a rotten practice. Bad decision, Country Living! Country Living is available free as a download from the public library. You do need to add Zinio but I already had a Zinio account for my digital UK mags. I only added the link here that was from the mag’s website. I dislike clicking through many slides too. Forgot to add the workaround to the slides. Below the first photo there is a grid symbol link. Click on it at least to see the gallery (without captions). Then click through any of those of interest and the page pops up. I love this segment! I have truly enjoyed reading about the dollhouse from the beginning. So much fun! Amazing. My mom still has end tables just like those in her house! 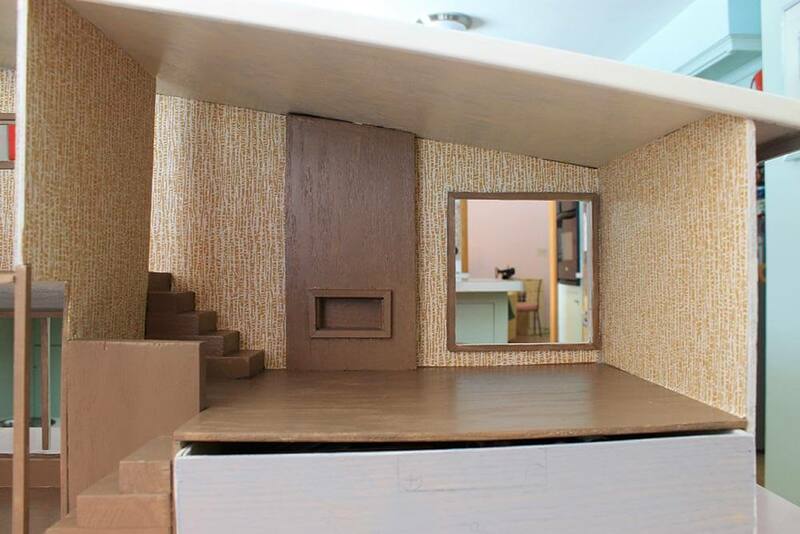 She also has a cabinet stereo very similar to the dollhouse version! She wants to get rid of it but I won’t let her. 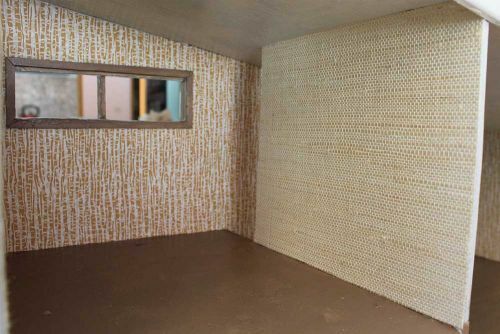 I love your wallpaper choices, and I can’t wait to see the updates with the tile and furniture.